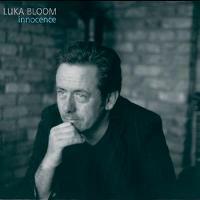 Innocence seems like a strange title for Luka Bloom's tenth studio album. At this stage of his career, Bloom is bound to have seen it all - done that, bought the overpriced dodgy boxer shorts. However, Innocence is an album that could easily be mistaken as an accomplished debut. Bloom's lyrics are so insightful and fresh that you'd be forgiven for mistaking him as a young and disillusioned twenty-something. That's no bad thing either. Musically, Innocence is just as as simple and static. The glorius acoustic opener Primavera is a romantic and heartful love song, the like of which would even tingle the nethers of Granny Grumpy. Subtle intrumentals such as the barely beating beautiful Peace On Earth are as joyous and enthralling as it's impressive album mates. Lovely. Luka's been on a roll since 2000's Between The Mountain And The Moon, and Innocence shows no dip inquality. Innocence is very much a celebration of how the ordinary in life has a special quality that can be more meaningful and take deeper root in the memory than seemingly more 'important' events. The music is laid back and blissful, capturing the reflective, often tender, emotions of the songs, but Luka's trademark rhythm guitar - that full, echoing, acoustic sound - is here on the album's centre-piece 'No Matter Where You Go, There You Are', an impassioned song in tribute to a Muslim friend in Galway. On an album that already contains its fairshare of highlights, this song deserves to go down as the finest thing he's ever written. The artistic imperative ebbs and flows, and there are some who won't be too enamoured with the tidal patterns in Luka Bloom's music these days. Evidently personally content, Luka's music bespeaks of matters spiritual rather than material. His belly is fired by personal reflection rather than political objection, and it makes for a satisfying gathering. There's a pinprick precision to the lyrical path of Forgiveness, a vulnerable honesty to Salvador and a refreshing bareness to his reworking of City of Chicago, each one buoyed by the most intriguingly minimalist arrangements you'll hear outside of a John Cage concert. Ken Edge's clarinet and sax, basted by Joe Csibi's double bass and Pat Collins' gypsy fiddle lines, cosy up inside the music like lifelong bedfellows. Bloom's tincture of contentment rings true. Luka Bloom has the sombre yet expressive voice of a man who's had his heart broken - and lived to sing about it. But that's not the only part of his body that has been in wars. Recuperating from throat problems and tendonitis for much of 2004, the Irish musician set about writing fresh material. The result is Innocence, 13 tracks of acoustic guitar-led balladry infused with warmth and wisdom. The perfect album to fall in - or out of - love to. His new album, Innocence, hears Bloom reflecting on his age (he's 50 this year) and touching memories of a bygone age of "incense" and "benediction". Recurring problems with tendonitis in his right hand and throat problems in 2004 forced Bloom to strum his guitar softly and sing softly. That 'less is more' approach has paid off handsomely, with a finely-crafted series of songs, which are all the more powerful for their stripped down sound... But it's Bloom's intimate, confidential vocal tones and the arrow-hearted melodies of songs such as June, Peace On Earth and Thank You For Bringing Me Here which shine the brightest on this little gem of an album. He may never match the revered critical and commercial appeal of big brother, Christy. But Innocence deserves to be heard by just as many people. It's Bloom-in' marvellous. A new album and another visit, March is indeed a happy month for his fans. This album is quite a departure for Luka in both the songwriting and the arrangements of the songs themselves. No longer reliant on just vocals & guitar, there is a fullness here which provides more depth to his maturing talents as a songwriter. In keeping with these changes, it took me a few listens to get used to the new sound - but once that was done, I again fell in love with his music. And take it from a fan, go and see him perform. It really is an uplifting experience for the soul! The younger generation of Irish singer-songwriters have tended to obscure Luka Bloom's place in the firmament. But with this more reflective and introspective album (his 10th), he restores himself to his rightful place in the pantheon of intelligent and passionate songsmiths with his uncanny ability to see the power and meaning in the atoms of daily life. Apart from the polished glow of a title track that evokes the nostalgia of religious ritual, this is nowhere more obvious than in the deliciously evocative 'Gypsy Song' a track spiced with the sultriness of the Middle East and Eastern Europe or 'No Matter Where You Go, There You Are', which tells the sad tale of an Algerian Muslim carpenter. 'City of Chicago' is a bleak reflection on the famine, while 'Primavera' is a poignant meditation on the ramifications of growing old(er). 'June' is one of the few songs to move up a gear, stirring the senses a la Van Morrison and 'Thank You For Bringing Me Here' is a remarkable love song to parents. Two instrumentals, the plangent 'Peace on Earth' and the zestful, but sadly brief, 'Larry Redican's Bow' show how Bloom can paint pictures with metal and wood too, and he is well served by the subtle contributions of Pat Collins' expressive fiddle and Mohamed Bouhanna on derbouka. Dominated by a voice more languorous and at ease with itself, Innocence is the less frenetic work of a man growing in maturity and wisdom, but still willing to take the road less travelled. We should take that road with him for a while longer yet. There's an unrivalled tenderness to Luka Bloom's enchanting, earnest songwriting - his musical and lyrical delivery possesses that special charm. Deft, delicate touch on the six-string and distinguishable Irish lilt in his honeyed vocals draws you in immediately with the heartfelt opener Primavera, from which the ensuing mood is set. The charm continues in the impassioned tale of a Muslim carpenter (No Matter Where You Go, There You Are), an emotion-charged message for parents in Thank You For Bringing Me Here and the spirited title track Innocence. Then, of course, there's a gentle dose of mellow instrumental (Peace On Earth) to complete the package. Bloom seems to always manage a sense of freshness with anything he puts his mind, voice and hand to and Innocence beautifully captures the emotions of these purposeful messages by a master of his game. Like the scent of a fresh Irish stew rolling over the green hills, this album is deep, hearty and full of good ole Irish flavour. Preceded by a critically acclaimed back catalog of songs, Innocence shows a stronger focus on the lyrics than earlier recordings. There are tales of love, entwined with the simple wish for peace that comes from living in a country and a world of war. In the track Miracle Cure, Luka sings, "When all the fighting is done - forgiveness." This album is not for everyone, but if Saint Patrick's day left you feeling like getting back to some true Irish roots then this intensely mellow album might be just what�s need to take you there. Bloom combines a seemingly unmatchable pair of musical styles on 'Innocence', coupling Arabic influences with his own Irish technique. The opening track Primavera seduces you into listening to the rest of the album... One of the most successful tracks on 'Innocence' is No Matter Where You Go, There You Are. The track follows an Algerian man called Mohamed through his journey from the north of Africa to Europe and eventually Ireland. The track features Mohamed Bouhanna on the Derbouka... This track showcases the poignancy and passion that you'd expect of Bloom along with underlying themes both of appreciating your new home and remembering where you came from through music; themes that are explored throughout the entire album. The songs City Of Chicago and Gypsy Music also speak of immigration. City Of Chicago discusses the benefits and hardships of moving from Ireland to the US in the 1800s while Gypsy Music looks at the cultural benefits of the European Union and the ability for everyone to learn from and share with each other, set this to a Gypsy-inspired sound. This is an album worth exploring for yourself, following Bloom as he takes a musical journey around the Northern Hemisphere whilst still remaining honestly Irish. It's so hard for me to single out a favorite song on any Luka CD, but I would have to say my heart and soul are the most touched by 'Thank You for Bringing Me Here' and 'No Matter Where You Go, There You Are'... He's also included his first recorded version of his song 'City of Chicago', made famous by that elder-statesman brother of his, in a softer and slower treatment that is a delight. The whole record is a fresh breath of spring sunshine to waft its way onto your CD player and surely into your heart. County Kildare born singer/songwriter Luka Bloom turned 50 this year, but his music sounds as fresh today as it did three decades ago when he first burst onto the scene. His is a rich career spanning ten albums and numerous world tours, and his new album sees him in fine form. When you listen to the album the first thing that strikes you is its slick production, as the instruments positively burst from the speakers. Album opener 'Primavera' is the perfect example, as the rippling guitars and soulful vocals sound impossibly vibrant and immediate. Moreover, the uncluttered arrangement allows the song plenty of room to breath, so that the smouldering saxophone solo is all the more potent. The stripped down sound continues on the uplifting 'First Light of Spring', where the simple marriage of guitar and voice again works wonders. On the next song 'Innocence' the Spanish inflection of the guitar conjures a bit of extra spiciness. Things hot up even more on 'Venus', where Bloom's vocal drops to a whisper and the double bass and clarinet add to the haunting atmosphere. On 'Gypsy Music' there's more Spanish spice, and the addition of a fiery Derbuka drum further raises the temperature. On 'No matter where you go, there you are' Bloom unfolds the tale of a North African man finding solace on the streets of Galway, and its catchy chorus and wonderful fiddle solo make it one of the most evocative tracks on the album. There's also an old favourite here too, 'City of Chicago', which was first made famous by Bloom's brother Christy Moore. The album runs out of steam a little at the end, but there's an uplifting quality to the album as a whole that keeps you coming back for more. Definitely worth checking out! Irish song bard Luka Bloom had a brief moment of notice in the United States with his Riverside recording. That record offered a furious and stunning strummed acoustic guitar technique, more like folk-rock than folk itself. His vocals were roaring and impassioned, but his own songs weren't quite there. He was looking deeper, but the writing was still on its way. With the gorgeous Acoustic Motorbike and Turf albums, glimpses of the mature songwriter flashed by, offering proof to both fans and critics of what was to come. Bloom is an artist who relentlessly pursues his muse wherever she leads. 2002's Between the Mountain and the Moon revealed that Bloom mastered his craft and stood in a league of his own. He is unequaled in his native Ireland, and the hoards of American and Canadian singer/songwriters could learn more than a little from Bloom's humility, discipline, and craft. On Innocence, Bloom goes deeper and wider than he has ever even attempted before. These songs are illustrated quietly, with his guitar, acoustic basses, reeds and woodwinds, a derbuka on a couple of cuts, a fiddle here and there, some percussion, a harmonica painting the back of a track, and a couple of backing vocalists when necessary. This is a spiritual record, full of love songs and paeans to the spirits of peace, tolerance, and letting the past go. It is not preachy, it is not strident, but its backbone is solid. It opens with gorgeous 'Primavera', a quietly stunning spiritual love song that bares the singer's heart as nakedly open, willing to be touched and healed by the Beloved. Bloom's acoustic guitar is extended and illustrated by Kenneth Edge's soprano saxophone. Elsewhere, on the title cut Bloom recalls his Catholic upbringing wistfully and the scenes of childhood. 'Venus' is a pledge of love and commitment that is so quietly tense and serious it chills the listener. The most profound song on the set is 'Miracle Cure', and its plea for forgiveness. It's social commentary free from clich�s or bombast. It's a small plea, one from an individual, one who recognizes his need for it and to give it and offers this realization as a prayer for the world. It's followed by a laid-back, sweet, spring-like instrumental called 'Peace on Earth'. Bloom displays his skills as a guitarist on 'Gypsy Music', but something else rears its head: the Celtic bard. Bloom's lyrics have become so elegant, so utterly his own - part story, part drama, all lyric, and tight. The elements are drawn from various traditions ancient and modern, but they all end up in his musical tales and reveries. Take the story of the famine recounted in 'City of Chicago', or the pastoral meditation of 'June'. 'No Matter Where You Go, There You Are' is the tale of a Muslim carpenter who leaves Algeria and travels across Europe until he hears the sound of a musician and traces that sound to its origin. The tenderness in his portrait of this man is utterly empathic. And it's that tenderness that sets Bloom apart, a notion that has crept into his work and asserted itself over ten studio albums. This is simply Bloom's finest moment on record. He's learned a lot and it's on offer simply for the listening - but don't be deceived by his apparent simplicity. It takes years to develop this direct kind of communication, one where the artist and his art are one and the same. His entire journey has put him in that rarefied world of songwriters who stubbornly eke out a living away from the limelight while creating great art; they deliver recordings only when they have something to say. Count in Bloom's company John Martyn, Jackie Leven, and Michael Chapman. A very smooth and mellow album by one of Ireland's great contemporary songwriters. Luka explores his interior life and finds himself at peace. His expressive guitar work and laid back voice are beautifully complimented by the haunting tenor sax of Kenneth Edge. Outstanding selections include Primavera, Miracle Cure, June and City of Chicago. My favorite song on the album, No Matter Where You Go, There You Are tells a story symbolic of the new Ireland. An Algerian leaves his home, travels around Europe and in Paris is inspired by an Irish fiddler. He follows him home and now works in Galway selling souvenirs on the street. A typical Irish song in the year 2006, but beautifully told and performed. Still regularly referred to as the younger brother of Irish folk music legend Christy Moore, Luka Bloom has gained international respect for his own series of excellent solo albums. Three discs on Reprise in the early '90s (the first, Riverside, is a gem) saw him flirting with wider commercial success, but his profile has dipped over the past decade. His talents have certainly not diminished, as Innocence proves. Bloom's clear and poetically expressive voice has an attractive Irish lilt, but his lyrical and musical approach is global. 'No Matter Where You Go, There You Are' is a moving tale of an Algerian Muslim now living in Galway, and it�s illustrated with Middle Eastern musical accents. Similarly, 'Gypsy Music' is a joyous tune with a real gypsy flavour. There's a more conventional Irish folk feel to 'City of Chicago' and 'Larry Redican's Bow', while 'Primavera' and 'First Light of Spring' are tender and gently haunting love songs. A sense of compassion and global humanism permeates this record, as exemplified by the final track, 'I Am Not At War With Anyone', and its final lines, "This rush to war was wrong, I just sing my song." It is a song well worth hearing. It's been a long ride for Luka Bloom since he burst into the United States in 1990 with his Irishman-meets-Amerikay recording 'Riverside' and its crackling opening tune, 'Delirious'. Bloom's bout with tendinitis has directed his folky songwriting and guitar work toward a more meditative, gentler approach in recent years, a trend that might make his work too fragile for some. 'Innocence' follows in that vein, as on 'Primavera' and the lovely 'First Light of Spring'. But Bloom can still tap a primal beat, as on 'Gypsy Music',' keeping things from getting too precious. The U.S. version of ''Innocence'' includes 'I Am Not At War', which shows that gentleness and strength can co-exist. Perhaps there's a deeper message there. It's difficult for a musician who sings about political or social issues to avoid the stereotype of the star using the limelight as a pulpit. But Luka Bloom manages this deft act on his newest release, Innocence. Bloom - who takes his name from Suzanne Vega's song "Luka" and the hero of James Joyce's "Ulysses", Leopold Bloom - sports a tranquil voice as his strumming guitar recalls a heritage of Irish musicians singing in an intimate home or pub atmosphere. The lyrics are contemplative rather than antagonistic, and most are infused with Bloom's Irish spirit. The album's title track is an introspective look back to a time of innocence when the young Catholic Bloom was awed at the sight of the candles and incense in church, waited expectantly on Christmas morn for gifts - a time when everything made perfect sense. The song sets the atmosphere for many of the other tracks as he continually returns to a theme of simplicity and insight through innocence. On 'Miracle Cure', Bloom sings of forgiveness as a powerful salve that can help heal all of the world's wounds. In 'Thank You for Bringing Me Here', on the other hand, he assumes the point of view of a young Irish girl as she thanks her parents for wanting her and permitting her see the world, even if it is a place of fear and strife. Innocence also includes two instrumental tracks, 'Peace on Earth' and 'Larry Redican's Bow', that provide short interludes and give the listener a respite from the thought-provoking lyrics of the other songs. While these tunes spotlight the exquisite instrumentalism of the album, all of the tracks are appreciable for Bloom's guitar. From the gentle plucked chords of 'City of Chicago', where he tells of the Irish diaspora's emigration to America, to the exotic strumming on 'Gypsy Music', as he talks of joining the modern-day movement of peoples across the globe, Bloom shows his talent with "me and my guitar, and my little Irish flag". Adding to the guitar base is a mixture of other instruments from mandolin (played by Bloom), fiddle, clarinet and saxophone to the more unique sounds of the darbuka, an hourglass-shaped drum used in Arabic, Turkish and Balkan music. These help to flesh out the songs while lending additional multiculturalism to Bloom's themes of global understanding and similarity. Bloom gives another account of the changing face of the world in 'No Matter Where You Go, There You Are', the lively ballad of an Algerian carpenter named Mohamed driven from his native land by war. After making his way to France, he is enchanted by the strains of an Irish fiddler and now calls Galway his home. The song's message concerns the universality of love and music, how a Gaelic tune can awaken a Muslim soul and how similar they truly are. It is perhaps the best song on the album, a true achievement given the quality of all of the tunes. The final track on Innocence is the beautifully simple protest hymn 'I Am Not at War with Anyone'. Bloom's steady conviction as he repeats the song's title after lines such as, "Go away war planes, you bring fear and shame" is almost childlike. Politics, money, debates and all the other complexities of life aside, war hurts and is painful, which is bad. Love is good. It's difficult to argue with such solid logic. Armed with a guitar and simple messages of truth, Bloom's songs resonate with two voices - that of a man looking back with all the wisdom he has gained through knowledge of life's problems and that of a child, innocent of cruelty and malice, just born into that world. Then again, perhaps the wisdom of old age and the innocence of a child are not that different, it's just during the time in between that we lose our way and make the mistakes. Luka Bloom would likely agree. Luka Bloom seems to be a happy man in the world these days. Hit latest release, 'Innocence' is at it says. It explores some themes, times and places when one could lose oneself in the tall grass of summer, or the first flowers of spring, and the chaos of the world faded away. For a while. For reality does creep in on the footsteps of a few songs, but the overwhelming vibe is one of more ease, less angst. The title track is a good example. LUKA BLOOM, Irish singer-songwriter Barry Moore, born in County Kildare, took his stage name from a Suzanne Vega song and a character in Ulysses, and he's put out ten albums since his 1990 debut, Riverside. Last year's 'Innocence' might be his most beautiful yet-- though I could've said that about every one when it came out. Bloom's approach is so sparse and direct, leaning heavily on his lyrics and his delicate guitar playing, that each song makes its mark individually: 'City of Chicago' is a great-famine weeper, 'June' sounds like an Astral Weeks homage, 'Salvador' celebrates Brazil's most interesting city, and 'No Matter Where You Go, There You Are' is a heart-wrenching story about a Muslim immigrant finding himself through music. His peace anthems aren't very subtle, but anthems don't have to be. It may seem odd for a 50-year-old artist to call his 10th album Innocence, but one listen to Irishman Luka Bloom's wonderful new release will take you back to a place of, well, innocence. Following the path of his older brother, Christy Moore, Bloom has mastered the art of passive reflection on what is. He delivers a thoughtful, emotional and incredibly original product with a clear view of the way things look to the common man. On 14 self-penned tracks, Bloom explores a variety of intra- and interpersonal issues, from the challenges facing immigrants ('City of Chicago' and 'No Matter Where You Go, There You Are'), aging and loneliness ('Doing the Best I Can') and the state of the world ('I'm Not at War'). His pure voice delivers sensitive and deep messages, without crossing into the dreaded realm of being overly precious. This is music that makes you think, and feel. By the time 'Innocence' begins, there is a low, mellow mood already built that makes the soul wholly receptive for the insidious splendor of Luka's lyrical genius. "I remember the taste / of the first kiss by the river / and the promises we'd keep / forever and ever... and I choose innocence / after my tears." 'June' is another fine example of the rebirth theme that weaves its way throughout this album with such a delicate and deliberate feel, bringing to light the true feeling of joy that Luka seems to have found in his ability to once more play music as he'd like. And dig the groovy Van Morrison-esque feel that the song gives off - an instant classic. A lovely and pensive album, Innocence finds Irish-born singer, songwriter, and acoustic guitarist Luka Bloom in very fine form. Once you've seen a lone Irishman infuse Prince's "When Doves Cry" with new fire, armed with nothing more than an acoustic guitar, a sweet tenor voice, and a spark in his eyes, becoming a fan is inevitable. Truth be told, by the time of that 1994 tour, I was already quite enamored of the music of Luka Bloom. Born Barry Moore, he's the younger brother of famed Celtic folk-rocker Christy Moore. In order to step out of the shadow of his older sibling, the junior Moore adopted a new name based on the title character from Suzanne Vega's classic 1987 single and the last name of Leopold from James Joyce's Ulysses. Odd, I know. This new persona was adopted on the plane ride from Ireland to the U.S., where he was discovered in the late 1980s, playing a club gig. As I was saying, Luka Bloom is a very charismatic performer...... While his discography here in the 2000s hasn't offered any huge surprises, his work has been consistently strong. And now, with even more time passed, I'll admit to succumbing to a bit of the comfort of nostalgia when I listen to his recent works. In my defense, Luka Bloom's is a very comfortable sound. It is warm without being empty and cheery. His brand of comfort isn't lying in the grass on a sunny day or curling up in a rocking chair with a cup of tea. Bloom's is the comfort of isolated reflection, like walking through a brisk afternoon down to a quiet pub, ordering a pint of beer, sitting at a table by the window, and stringing together memories, histories, and thoughts of passersby. This pensive quality is immediately apparent on Luka Bloom's new album, Innocence. There he is on the cover, lost in ruminations. That photo offers an accurate projection of the mood that underscores this CD. Almost all of Luka's music is hemmed by melancholy, aside from a few outbursts of goofy, manic joy. However, those moments-songs like "Delirious", "An Irishman in Chinatown", or his cover of LL Cool J's "I Need Love"-are from his past. Innocence, as may first seem ironic, is tinged with a lovely world-weariness, through and through. The whole of the album is summarized well by these lyrics from the title track: "I still love the smell / of the innocent years / And I choose innocence / After my tears". Bittersweet remembrance and longing for a purity lost are made explicit in those words, but the same feeling resides throughout. This is apparent even in the pretty instrumental "Peace on Earth", where Bloom's sighing guitar line is augmented (as are a handful of other tracks) by the quiet thrums of a double-bass and some very understated soprano sax playing (and, unless that instrument is being played by John Coltrane or Branford Marsalis, understatedness is the ideal approach). What idea could seem more remote, more innocent, perhaps, or na�ve, than world peace? Still, this is the ideal that the gentle soul of Luka Bloom earnestly reaches toward. That he's not a dopey optimist allows a song like this to hit home. Elsewhere on the album, Bloom offers us wonderful miniaturized stories of Salvadorans wishing for someone's return from Brazil, a girl walking along the beach in Fanore, and Irish immigrants in nineteenth century Chicago, dreaming of a homeland before the famine. In case I've led you to believe that the mood of this album is monochromatically blue, it does contain its share of major-keyed tunes. Although they're all performed with the same mellow spareness as the disc's more meditative numbers, they add a nice balance in tone to the record. The addition of fiddle and light percussion to a few tracks also aids in serving up just enough variety to keep the listener's ear attentive. These little changes in instrumentation and subtle shifts in mood never break the album's flow; rather, they give contour to the experience. And Luka Bloom's Innocence is a very fine experience, indeed. A lot has happened since Barry Moore renamed himself Luka Bloom and recorded folk covers of songs by LL Cool J and Elvis Presley. Over nine albums, his songwriting has grown more confident and his ideas more concise, making the small, spare Innocence his most successful work to date. This is Bloom at his sweetest - playing light-fingered acoustic guitar and singing about love, hope, reconciliation, and freedom, with only the gentlest accompaniment on soprano saxophone, double bass, fiddle, or derbuka (a Turkish hand drum). The net effect is unabashedly romantic, with the warm, soft tones of nylon strings matching the childlike simplicity of the melodies on such songs as 'Primavera', 'Venus', 'June', and the title track. Even Bloom�s more political songs, which sounded so strident in the past, are now filled with compassion. In 'No Matter Where You Go, There You Are', an Algerian immigrant struggles with life in Galway; in 'I Am Not At War With Anyone', the singer sends his love to both Iraq and America, both Israel and Palestine; and in 'Miracle Cure', he offers forgiveness as the solution to the problems of the world. It�s a beautifully relaxed album, perfectly at peace with itself, and grows richer with every listen. Luka Bloom is an artist who has been around for years, but somehow he slipped by me. Not totally, I knew his name and would occasionally hear one of his songs on the radio and think, "Hmmm, that sounds pretty good." Still, I never got around to getting a CD, going to a show or otherwise following up on him. So when I put on Innocence I was surprised to find myself transported. For a few weeks I listened to the disk at least once a day, finding more depth each time. Like much of the material on Innocence it can be heard as being personal or universal, romantic or political. Speaking of the political, I want to make a bumper sticker of the title of the closing song, 'I Am Not at War With Anyone'. Taken as whole, Innocence might be perceived as a study in how we live in a time of global travel and migrations yet remain emotionally connected to our own heritage. The two tunes that deal most explicitly with the theme are 'City of Chicago' and 'No Matter Where You Go, There You Are'. 'City of Chicago' is another telling of the Irish migration to America during the famine years. The arrangement is bare bones, just Bloom on guitar and vocal. There may be a little double tracking of the guitar, but it is easy to imagine Bloom performing this alone on stage and having it sound exactly the same. A few other tracks receive the same treatment and it shows what a talented instrumentalist Bloom is. 'No Matter Where You Go, There You Are' is a compelling story of a Muslim man who flees Algeria rather than fight in a war. He travels throughout Europe until, drawn to the sound of an Irish fiddler in Paris, he finds connection with the music and ultimately a new home in Galway. Musically it weaves middle-eastern drumming with an Irish melodic sense as it makes larger political issues personal. 'June' blends Celtic folk with chamber jazz along with repeating phrases that recall Van Morrison to marvelous effect. The backing musicians are uniformly excellent including a trio that appears to be Bloom's band; Kenneth Edge on reeds, Joe Csibi on double bass and Ray Fean on percussion and drums. In short, Luka Bloom's Innocence is the work of a master singer/songwriter/guitarist working at the top of his game.